I find such peace in the desert, and lucky for me, last evening found me here in Tucson helping with a work event. Before I fly home, I rose early to get in a little time on the trail in the foothills of the Coronado National Forest, just north of town. I chose the Finger Rock Canyon Trail, whose trailhead is named to honor the late Richard McKee, a conservation advocate and former deputy county attorney, who years ago helped prevent a land trade between the federal government and Asarco (a Tucson-based mining company) that would have allowed an open-pit copper mine on a historic ranch south of Tucson. Thank heaven for people like him! Are these cactus shapes wacky or what?! 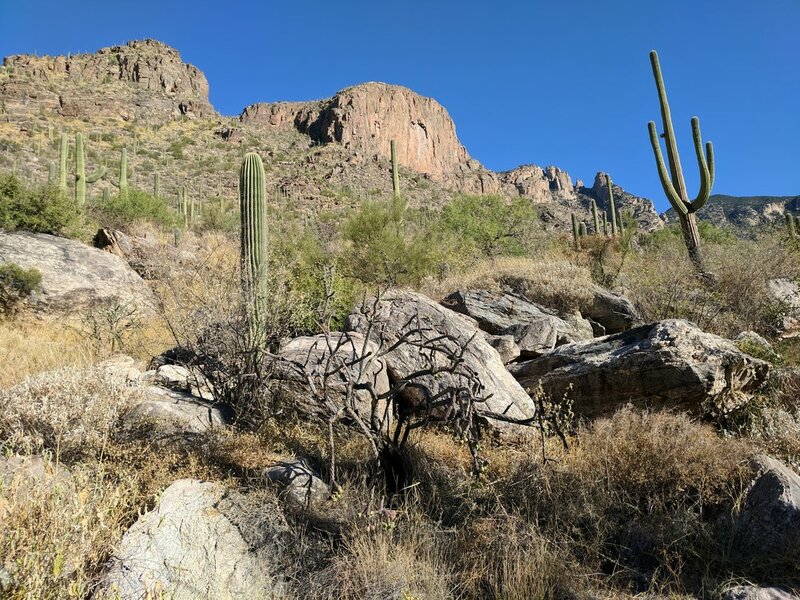 Today's hike reminded me a bit of the trails around Scottsdale; the trail meanders up a canyon, surrounded by saguaros and other cactus species too. The hillsides provided a bit of shade along the way, and the colors in the early morning light were fantastic. Enjoy the photos, & see you on the trail!